As most individuals know, content marketing is a significant element of having a successful online marketing strategy. “Content is king” is a familiar saying amongst online marketers. However, in today’s modern market, how content is shared now plays a second fiddle to the quality of the content that is produced. 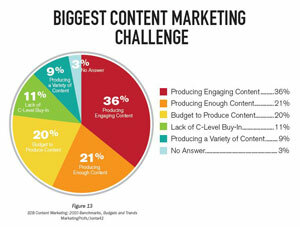 Although content marketing seems like it is not that difficult initially, in reality, it is not that simple. For your business’s content marketing campaign to be considered a success, you are going to need to possess a well developed strategy. Just some of the considerations that you are going to need to take into account include your industry, the type of content that you are producing, and your various distribution channels. Essentially, if you produce content, whether it be for web pages, a blog, or any type of other online content, you can safely consider yourself to be a publisher. It’s now time for you to assume the position of a publisher when it comes to creating your business’s content marketing strategy. The first step in creating a successful strategy is to make an objective assessment of the existing content that your business possesses. It is possible that you may be able to refine some of your existing content to use for a new marketing campaign. Do you have an old blog post, or other type of similar content, that could be made relevant again with a little tweaking? Likewise, an existing video that you have could be edited to contain new and relevant information. If you have “old” content that can be repurposed, you are one step ahead of your competition. Once you have conducted a comprehensive inventory of your existing content, the next step is going to be creating new goals for your content marketing strategy. Before strategy development can begin, you must have a clear, concrete picture of the goals you want your marketing initiative to accomplish. If you don’t know what it is you want your marketing campaign to achieve, how can you determine the pathway to success? What does your idea of success look like? It is imperative to ask yourself why you are creating specific content and what it is that you want this content to do for your business. Do you want to increase the amount of organic traffic that is driven to your website? Do you want to get potential leads to sign up for a business newsletter? Other potential goals that your content could achieve include increasing customer retention rates, generating new business leads, or obtaining higher conversion rates. Be aware that your goals can change with each new piece of content that you produce. Some shift in expectations should be expected. The most important aspect of creating successful content is that each piece of content you produce contributes to the success of achieving your business’s primary goals. Creating a content marketing campaign does not happen overnight. It is going to take a significant amount of your time and effort, as well as some trial and error. The content that is produced should be modeled after your primary business objectives. In doing so, the content production process is going be even more productive, and it is going to maximize the returns you have made in your investment. Additionally, once you have determined what goals you want your content to achieve, it is going to be much easier for you to use tools, like Google Analytics, to track the success of the content you’ve produced. The Target Audience – What are the demographics of the target audience? What are their particular behaviors? Online Market – What is the area of the Internet where the target audience spends the majority of their time? Keyword Research – What are the exact keywords that should be included in your content to maximize its SEO value? Social Listening – What is the kind of content that people are sharing the most? Where are content gaps that should be filled? Researching these preceding areas is going to provide you with the information that you need to know to conceptualize what your content should be like. We’re going to take a break here for today, and in our next post, we’ll talk about the importance of having an editorial plan, content creation and promotion, and how to measure results.